BANGKOK, Thailand - “It is best to let the markets determine rice prices; it should not be dictated by the government.” This is what Vichai Sriprasert said during a plenary session at the 4th International Rice Congress (IRC2014) on 30 October in Bangkok, Thailand. "Thailand had been the world's largest rice exporter for thirty years," said Mr. Vichai Sriprasert. He pointed out that the country became successful because of the free trade policy initiated by King Rama IV 150 years ago. Sriprasert is the president and CEO of Riceland International Ltd. and an honorary president of the Thai Rice Exporters Association. Partnerships among governments and the private sector are strengthening farmers’ skills in applying sustainable farming practices. These initiatives were shared by experts from around the world during the symposium, Mainstreaming Sustainable Rice – Rice Value Chain Global Transformation. Topics included: (A) Sustainable rice: what is it and what is it worth?, by Sarah Beebout; (B) Voluntary standards and roundtables: what can we learn from other industries, by Hans Perk; (C) The Sustainable Rice Platform (SRP): a global multi-stakeholder platform, by Wyn Ellis; and (D) Sustainability and IRRI's ecological intensification platform, by James Quilty. Private companies that work on rice also shared their programs aimed at helping farmers become good managers and environmental stewards by promoting sustainable farming practices. Companies with sustainability campaigns include: (A) Mars food and sustainable rice sourcing, by Luc Beerens; (B) Bayer and a sustainable solution to strengthen rice production, by Mahesh Girdar; (C) The Kellogg's Origins Project: a real opportunity for rice farmers in Spain, by M. Català; and (D) Lousiana State University: rice sustainability and rice grower program, by Steven Linscombe. Sustainability of farming environments and resilience of rice value chains are assured by making farmers understand and accept, complex scientific concepts around achieving sustainability. This was what experts at the International Rice Congress, now happening in Bangkok, Thailand, proposed as a way to achieve an environmentally-sensitive rice industry. Various impact assessment studies on IRRI varietal contributions and natural resource management (NRM) technologies were highlighted during a science symposium titled Frontiers in ex post impact assessment of rice technologies: What lessons can rice research institutions learn? Results showed positive returns on rice yield, household income, livelihood, and food security. Asia faces a "double burden" of malnutrition. While Asians continue to deal with problems of undernutrition, they are experiencing a rapid increase in noncommunicable disease, such as obesity and diabetes, which are brought about by overnutrition. During the scientific session on Healthier and Nutritious Rice at IRC2014, developments in rice varieties with low-glycemic index, high-iron, and high, -zinc were presented. Also discussed was the research on increasing the nutrition content of oil obtained from rice bran. Both undernutrition and overnutrition exact heavy economic and social burdens on countries at all income levels. According to the Food and Agriculture Organization of the United Nations, the economic costs of malnutrition due to lost productivity and direct health care costs total US$3.5 trillion, per year, globally. During an Innovations in Rice Science session, scientists from different organizations discussed new technologies that aid in better understanding rice genetics, and how these technologies help make rice breeding more efficient. 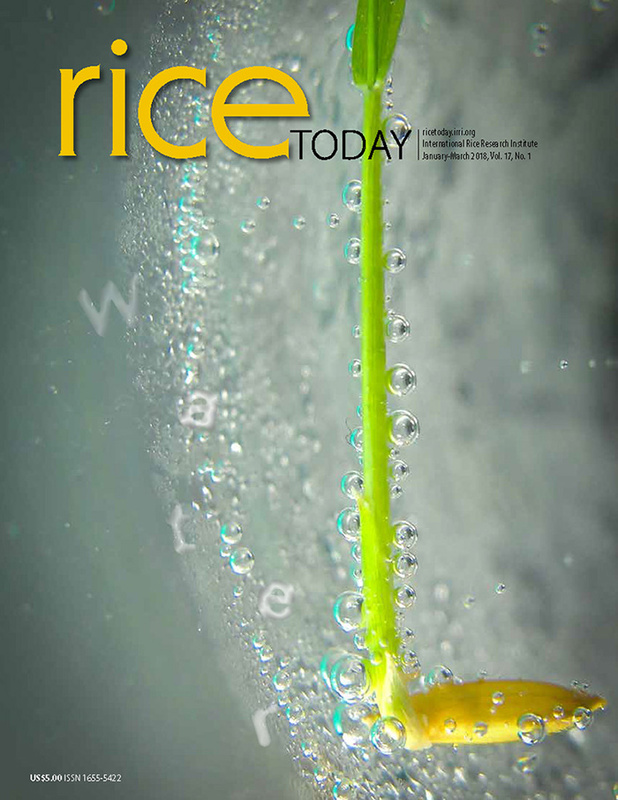 Trait and gene discovery are precursors to the development of new rice varieties that possess desirable traits, such as flood, drought, and salinity resistance, while maintaining high yields and other preferred grain qualities. Topics presented included: 1) Genome reshuffling populations to improve yield potential by T. Yamamoyo; 2) A nested association mapping population by Mathia Lorieux; 3) Multi-parent advanced generation intercross (MAGIC) by Glenn Gregorio; and 4) Wheat magic, linking the genes that regulate flowering time to inflorescence architecture by Steve Swain. How do rice roots contribute to stress response and yield? Advances in rice root biology research involve novel traits and genetic regions associated with root growth and stress response. Showcased in a symposium convened by IRRI physiologist Amelia Henry were new concepts, such as: (1) linking whole genome association mapping with functional genomics of rice root traits; (2) importance of plasticity in the rice root's response to drought; (3) hormone effects on root anatomy and biochemisty; and (4) the integration of root morphology and functionality in developing new rice root ideotypes. These topics give light to how the roots of rice contribute to rice yield and the plant's stress response. BANGKOK, Thailand, 31 October 2014 - Senior agriculture officials of several Asian countries said that the research program of the International Rice Research Institute (IRRI) aligns well with their national priorities. The International Rice Research Institute (IRRI) and the Nepal Agricultural Research Council (NARC signed a 5-year work (2014-2019) plan to strengthen the country’s rice research and development program on 21 October in Kathmandu. NARC-IRRI work plan 2014-2019 document was signed by Dil Bahadur Gurung, NARC executive director, and Matthew Morell, IRRI deputy director general-research, signed the plan in the presence of Bhartendu Mishra, Honorable Member in-charge for Agriculture, Science, and Labor in National Planning Commission. Dr. Mishra, the chief guest of the function stressed the need for increased collaboration with IRRI because rice is the most important crop of Nepal. He acknowledged the role of IRRI in providing rice technologies and capacity building of research facilities, scientists and extension officers of Nepal. Dr. Mishra said he will work with the Government of Nepal to make more resources available for rice research and development. He also praised the contribution of scientists working on rice with very limited resources and advised them to continue to work on 14 collaborative projects identified and included in the current work plan. Dr. Mishra encouraged them to develop farmer-friendly rice technologies for easy adoption to enhance the productivity of rice in Nepal from the present levels of 3.2 tons per hectare. He acknowledged that several climate resilient varieties have been developed jointly with IRRI by NARC scientists and these need to be made available to the farming communities by adopting faster dissemination methods. Dr. Gurung expressed his gratitude for all the help IRRI has been providing Nepal in developing new rice varieties and technologies, and training for its scientists for over four decades. He said that the five year work plan is a very important and significant step that will further strengthen the ongoing collaborative rice research between Nepal and IRRI. He expressed full confidence that Nepal’s science community will make full use of IRRI’s global experience in addressing and overcoming local problems and impediments that hinder rice productivity. He also urged IRRI’s help in improving Nepal’s biotechnology and pathology facilities and hybrid rice development. Dr. Gurung also acknowledge the guidance and leadership JK Ladha, IRRI representative for India and Nepal, has been providing to Nepal’s agricultural scientists during the past two decades through RWC, CSISA projects, and training of a new generation of rice scientists in the country. Dr. Morell mentioned that, though IRRI HQ is located in the Philippines, the work it is doing is nothing but the sum of all the work carried out the collaborators across the rice growing world. He emphasized the Institute’s intent to work together and establish stronger partnership with national programs. He informed the gathering that the present work plan is just the start of building a systematic engagement in Nepal. Dr. Ladha presented the Rice Research Strategy for Nepal, a document prepared by IRRI in collaboration with NARC, where the overall goal of the rice program is to increase rice yields by at least 3% per annum for the next two and a half decades. He highlighted the challenges rice cultivation facing and also provided a list of priority research portfolio for rice research and development. Also present at the event were principle rice collaborators, directors and division heads of NARC. Dr. Bhaba Tripathi, senior associate scientist, IRRI Nepal Office facilitated proceedings. A detailed presentation of the 14 projects included in NARC-IRRI work plan was prepared by Mr. N. K. Yadav, rice coordinator and Mr. Ram Baran Yadav, NARC senior scientist. Coinciding with the 5-year NARC-IRRI work plan signing, the two agencies launched the IRRI Nepal website on 21 October in Kathmandu. The website, designed developed by IRRI HQ and India IT teams, contains information on IRRI collaborative work in Nepal and information on Nepal nationals who worked or are working in IRRI, Nepal scientists trained by IRRI, updates and IRRI events in Nepal. The web site was formally launched by Dr. Dil B. Gurung, NARC executive director, and Dr. Matthew Morell, IRRI deputy director general-research before NARES representatives and local media. JK Ladha, IRRI representative for India and Nepal, demonstrated and navigated through the live website and explained contents and importance having the information accessible to the public. Dr. Ladha appealed to national partners to help make the web site a repository of knowledge on rice research in the country by contributing information from time to time. Marie Haga, executive director of the Global Crop Diversity Trust (GCDT), said that rescuing and conserving crop genetic diversity means giving our generation, and the next, the means to protect our sources of food. “Genetic diversity is the prerequisite to food security. It is where the traits that help agriculture adapt to challenges of the future will be coming from,” said Haga. Haga was the first plenary speaker at the ongoing 4th International Rice Congress, which has gathered 1,500 participants from 69 countries, in Bangkok, Thailand. “There couldn’t be a better career than one in agricultural research if you want to make a difference in the world,” said Matthew Morell, IRRI’s deputy director general for research. Morell said this during a forum with international donors from the public and private sectors, research organizations, and other stakeholders of rice research and industry. BANGKOK, Thailand - Equitable food security demands that the land produce enough, farmers profit, and the poor do not go hungry. Robert Zeigler, director general of the International Rice Research Institute (IRRI), added that well-informed governments will be in a better position to secure the food supply and to protect farmers and consumers in times of crises. “We still feel the shocks of the 2007-08 rice price crisis, and the problems then were issues of a lack of transparency and accurate information,” Zeigler said. The Young Researchers' Lunch for October hosted Uma Shankar Singh, a plant pathologist and the South Asia Regional Coordinator of the Stress Tolerant Rice for Africa and South Asia (STRASA) Project on 23 October 2014. STRASA has successfully developed and delivered climate-smart rice varieties to millions of farmers in unfavorable rice-growing environments. Dr. Singh discussed the challenges and successes with the dissemination of stress-tolerant varieties with participants Prasad Senadheera, Ebna Rashid, Julius Ver Sagun, and Walter Israel. He emphasized that the success of the project was partly because it allowed for flexibility in its strategies and shifted its approaches when original plans did not work. He also gave examples of how dynamic leaders can speed up project development. IRRI Training Center, in coordination with Global Rice Science Scholarships, conducted an Effective Presentation Skills Workshop on 23 October 2014 at IRRI Headquarters, Philippines. The one-day workshop is designed to develop and enhance the presentation skills of scholars, researchers, and scientists who will present their researches at the 2014 International Rice Congress in Bangkok, Thailand. The workshop was attended by Chaivarakun Chaipanya, Teresita Folledo-Bueno, and Shiela Marie Selisana from Plant Breeding, Genetics and Biotechnology Division; Judith Galeng-Lawilao, Wanju Shi, and Anandhan Tamilselvan from Crop and Environmental Sciences Division; and Maria Teresa Clabita and Arnold Joseph Reyes from Training Center. A major part of the workshop was the individual presentations of the participants which were then critiqued by the resource person. Maria Socorro “Achu” Arboleda coordinated and facilitated the workshop. For more training opportunities, please visit http://training.irri.org. The International Rice Research Institute (IRRI) Training Center is conducting the Basics of Rice Production Course from 21 to 23 October at IRRI Headquarters, Los Baños, Laguna. The three-day course provides an overview and updated best practices and latest technologies, from seed preparation to post-harvest practices, in wetland rice farming. In addition to classroom lectures on rice breeding, physiology, water management, pests, and diseases, the course features experiential learning where participants “get their feet wet” through actual on-field farm operations. There are 19 participants from Australia, Nigeria, Philippines, Sri Lanka, Switzerland, and the United States. Most of them are IRRI HQ-based staff who would like to learn rice production through hands-on activities. The course is coordinated by Noel Magor, head of the Training Center, and Eugene C. Castro, Jr., senior research manager and course facilitator. Basics of Rice Production Course is offered twice a year. This is the second offering for 2014. For inquiries about this course and more training opportunities, please visit http://training.irri.org/ or send us an email at IRRITraining@irri.org. More than 60 farmers from Tanay and Pililla in Rizal Province, together with 10 officers from the Department of Agriculture (DA), visited the Rizal Agricultural Station (RAS) at Cuyumbay to discuss Ecological Engineering for Pest Management at the Open Day coordinated by International Rice Research Institute entomologists and RAS staff on 14 October. A presentation at the RAS auditorium introduced the farmers to ecological engineering and informed about how they might initiate similar practices. Farmers were then informed about the management of insects, golden apple snails, rodents and birds through ecological engineering methods at the RAS field site. The participants were welcomed by Mr. Billy Fortun, station manager, RAS, and Dr. Alexandra Jamoralin, DA-Regional Field Office 4A-Calabarzon. The event and related research activities were funded by the German Ministry of Science and Education as part of the LEGATO Project, the DA–Bureau of Agricultural Research (DA-BAR), and the Global Rice Science Partnership (GRiSP). The Myanmar Department of Agriculture Research (DAR), Ministry of Agriculture and Irrigation conducted a hands-on training on quality rice seed production to improve the capacity of farmers, extension workers from both government and implementing partners, and seed producing agencies to produce quality rice seed that may ultimately increase the country’s rice productivity at Myaungmya Research Farm, Yezin from 29 September to 2 October. The training was attended by 32 progressive farmers of LIFT A, LIFT B, ACIAR, and USAID projects with IRRI from Bogale, Mawlamyinegyun, Labutta, and Maubin townships; 13 staffs from local institutional partners (WHH, GRET, MercyCorps, Proximity Design, Radanar Ayar); and 3 Department of Agriculture (DOA) staffs. U Myint Aye, DOA district officer and U Htain Linn Tun, Myaungmya Research Farm Manager closed the session and distributed the certificates to all the participants. The training was primarily aimed for sustainability of IRRI project in the delta region by enabling progressive farmers for seed purification and production for self-sufficiency to marketing through home-scale to community seed bank approach which plays a vital role in subsistence agriculture. The hands-on training on quality rice seed production was based on principle of “learning by doing” and focused more on practical activities in the rice fields with only one classroom session on rice plant morphology, growth stages of rice, nursery bed establishment, crop management, quality seed production and quality control, and postharvest postharvest handling from seed drying to storage methods, and developing knowledge dissemination and action plans for quality seed production. Practical demonstrations covered identification of distinct morphological characters of rice plant, seed purity and germination test, dry and wet bed preparation, transplanting, fertilizer calculations, panicle selection, panicle to row sowing, transplanting, rouging at different growth stages, and seed drying and storage. The inaugural session was chaired by Dr. Romeo Labios, IRRI Scientist in Myanmar with Dr. Khin Maung Thet, IRRI-USAID scientist; and local officers from Department of Agriculture (DOA). U Myint Aye, district officer, and U Tin Myaung Nyein, township staff officer of Myaungmya area, provided the support and collaborated with IRRI in Myanmar. The training was sponsored by LIFT-A project and Dr. Ye Tun Tun. IRRI-LIFT A team members (Dr. Swe Zin Myint Thein, May Nwe Soe, Sandar Winn, Aye Aye Thant, Aung Myat Thu, and Palal Moet Moet) coordinated and served as resource persons. Dr. R.K Singh, IRRI senior scientist, facilitated the event. Thirty participants from 10 South and Southeast Asian countries attended the training. Participants were exposed to a two-day rigorous hands-on field to nursery bed preparation, seed cleaning, field preparation, transplanting, rouging, among others. Rakesh Kumar Singh, senior scientist at IRRI and training coordinator, and Dr. P.K. Singh, professor, Department of Plant Breeding and Genetics, BHU demonstrated panicle selection, emasculation, tagging and bagging. The training was concluded with vote of thanks by Dr. Manzoor Hussain Dar, senior associate acientist at IRRI.